Where Are Your B2B Prospects Hiding? When was the last time you used your smartphone to look something up online? My guess would be today. Am I right? Smartphones have changed the way your prospects interact with vendors. With more touchpoints than ever before, it’s critical that you have an understanding of how your prospects use their devices and how your content can help in the moments that matter the most! Think With Google, recently conducted a study that revealed how and when your prospects use their devices throughout the day. In order to reach your prospects online, you need to better understand their journey. We live in a world of instant gratification, and we’re constantly turning to our devices to find it. Your prospects are no different. It’s important to consider what devices your prospects are using and which touch points you can use to engage them. This way you can reach them with the right message, and more importantly, on the right screen. It’s also important to know when your prospects are most likely to use their devices. Smartphone usage is consistent through the day and well into the night. On the other hand, computer usage peaks around 8 pm. Your prospects also move back and forth throughout the day to accomplish their tasks. In fact, over half of users rely on more than one type of device daily, with 1/5 of them using another device while also using a computer. When your prospects watch video content online, they watch it on the most convenient screen. So if they’re on the phone, they’ll watch it on their phone. And if they’re on their computer, they’ll watch it on their computer. On computers, viewers watch more involved content, like finance and auto. On mobile, viewers watch less involved content, like DIY and reviews. For you, it’s important your marketing strategy reflects the behaviors of your prospects. Here’s a great resource to know what they really want from your video content. 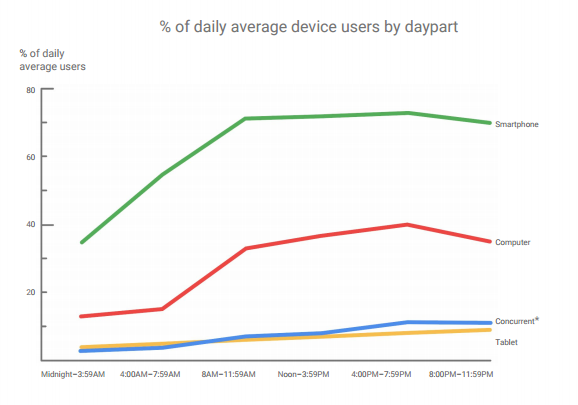 An even distribution of users browse the web daily using their computer or phone. If your website isn’t mobile friendly, your prospect will not have a friendly experience on your site and will probably leave immediately (57% of mobile users will abandon your website if it takes more than 3 seconds to load). Moving back and forth between devices makes completing tasks easier. The web is one of the most used resources. You need to know how and when your prospects are searching online in order to reach them with relevant content. Interested in learning how to create relevant content? Download our Content Marketing Essentials for Surviving the World of Modern Lead Generation.